This Uganda highlights and mountain gorillas tour explores the lush southwest of the country. This is a privately guided trip, which takes in Uganda’s wonderful highlights and includes a handful of local excursions that will help you get beneath the skin of the country known as the Pearl of Africa. The tour begins in peaceful Entebbe, where you can relax for a night before heading out to track chimpanzees in Kibale Forest. In Queen Elizabeth National Park, see a range of savannah wildlife on game drives in a 4x4 and safari boat before heading to the Bwindi Impenetrable Forest where you’ll trek in search of the rare mountain gorillas who live here. 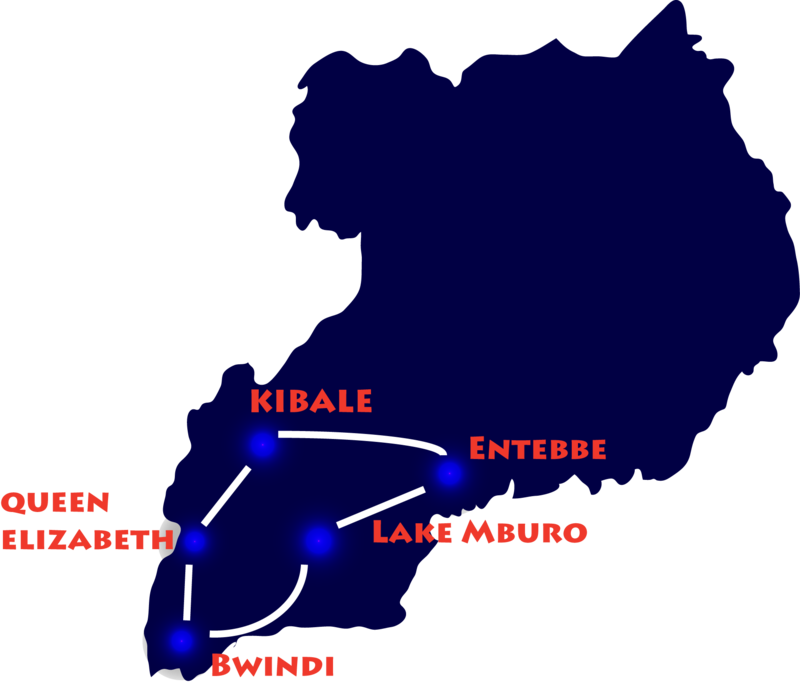 Before you return to Entebbe, spend a couple of nights in Lake Mburo National Park, enjoying a game drive, boat trip or perhaps a cycle ride. At Mbamba Swamp, take a dugout canoe ride through the papyrus, watching out for the bizarre, prehistoric looking shoebill stork that lives here. Travel back to Entebbe by speedboat, before spending a final night here, with a sunset cruise on Lake Victoria rounding off your memorable tour. This itinerary has been carefully designed to include many of Uganda’s most celebrated highlights at a comfortable pace and within 10 days. On this trip you will visit Deo’s Model Homestead Tour, a project we have been involved with in previous roles here in Uganda. Any community or wildlife excursion that we feature, we’ve ensured no-one is being exploited and all involved benefit positively from the exercise. Plan for giving lots and lots of gratuities. make sure you have loads of new USD5 bills--small bills make it a lot more flexible in giving tips. The recommendations and itinerary that was prepared by Kevin Nicholson was spot on.